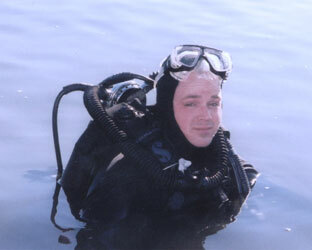 Michael Story's first dive of 2006, in Lake Whitney, south of Fort Worth, Texas. Gear includes Deluxe Pinocchio mask, signature Jacques Cousteau US Divers wet suit, late 1960's Royal Aqua-Master, 1958 US Divers tanks, and Scubapro Jet-Fins. 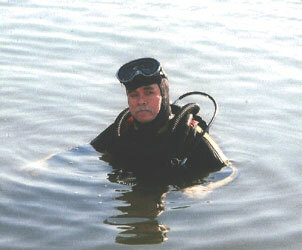 Michael's son, David Story, also diving in Lake Whitney. 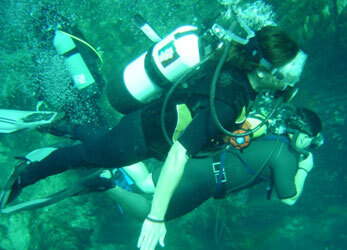 This is David's first dive with his Royal Aqua-Master. 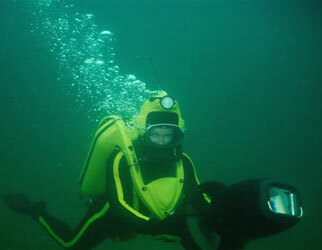 David, now 31, has been diving since he was 12. According to Michael, David "has the vintage bug, but not the cash". David, left, and Michael on the right. Both of their regs have a new hookah reducer nut that Michael developed. Any 3/8" thread hose or splitter can fit on it. Lake Whitney looks like a great place to dive, although Michael says the water is really, really cold! Michael Story at the Horseshoe, Okinawa, 1971. 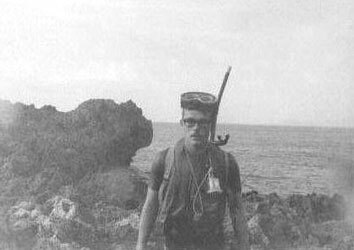 He had a Deluxe Pinocchio mask with corrective lens, "L" snorkel, Dacor vest, 1/8" Healthways wet suit top, and Voit Viking fins (not shown). Note the Nikon light meter hanging there. Michael says he still has it. Jim Underwood at Monza Beach, Okinawa, 1971. He is using a DA Aqua-Master regulator with unknown mouthpiece and hoses (they were extremely long), standard Marine Issue USD oval mask, Jet fins, Turtleskin wet suit, and USD tank with "I" valve (no reserve). 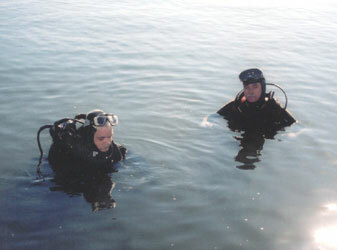 Michael and Jim timed this dive with a watch only, no SPG, no reserves. Depth was about 60 ft. The current retuning in from the dive was over 4 knots. They hand crawled across the bay floor holding onto dead coral with outgoing tidal wash, and swam like "ell" with the ingoing tidal wash. Michael's extra pair of Marine Corp issued leather gloves held up nicely on the coral. 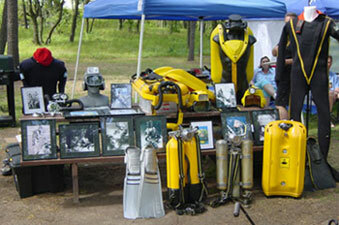 Vintage equipment divers at Weeki Wachee Springs, Florida. April, 2006. The water was about 40 ft. deep. -Photo by Chuck Tenge. 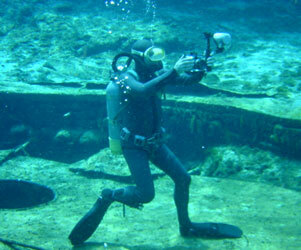 Vintage diver Allan Klauda with his underwater camera, at Weeki Wachee Springs, Florida. -Photo by Chuck Tenge. 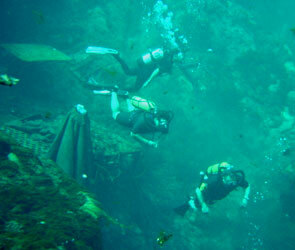 More vintage divers at Weeki Wachee Springs. -Photo by Chuck Tenge. 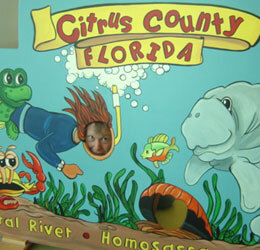 Will the real manatee please stand up? Maybe this is Chuck Tenge himself! -Photo submitted by Chuck Tenge. 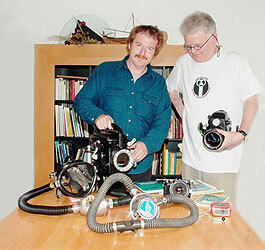 Dan Barringer of Vintage Scuba Supply, and Franz Rothbrust of Neustadt, Germany, look over some of Dan's recent acquisitions bought on eBay Germany. Franz was kind enough to invite Dan and Linda to his home in Germany. Some of the rare items on the table include a Bolex H16 underwater movie camera housing and a Swiss Colombo two hose regulator. While in Germany, Dan and Franz also visited author and bibliophile Wolfgang Freihen. 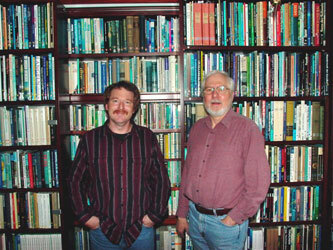 Wolfgang collects scuba and diving books and literature, including any type of literature dealing with the undersea world. This photo shows only a small portion of his collection, which is probably the largest in all of Europe. Wolfgang was very interesting, helpful, and also a wonderful host. Franz Rothbrust of Neustadt, Germany. 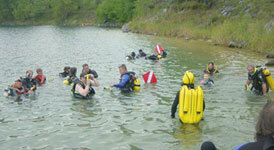 Franz says the summer lake diving there is superb - clear, warm water, and lots of fish! Tim Vertongen of Belgium. 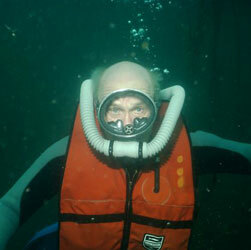 Tim is the only vintage diver that he knows of in his area. 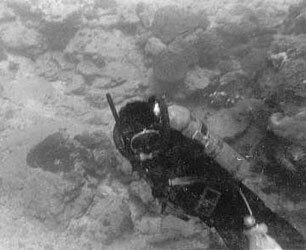 He dives in an old mining quarry, using a Royal Mistral regulator, single 12 liter Spirotechnique tank dated 1961, Fenzy horsecollar BC, SOS Bend-o-matic, Beuchat Jet Fins, and Spirotechnique compass and depth gauge. 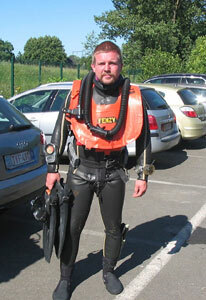 The wet suit was made by Spirotechnique, in Brussels, in the late 1960's. 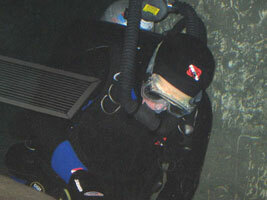 Bill Steele, diving with his Mistral at the Omaha Zoo. 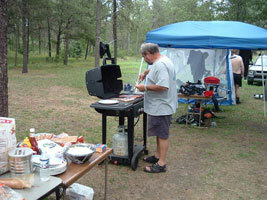 Dave Krafft, barbecu-er extraordinaire, at the 3rd Annual Vintage Dive Assembly at Lake Wazee, August 2006. 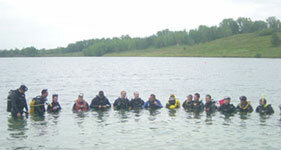 Vintage divers test the water at Lake Wazee, August 2006. 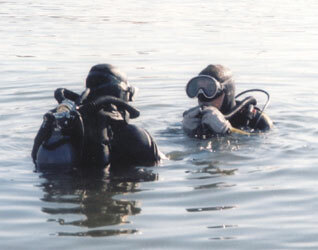 3rd Annual Vintage Dive Assembly at Lake Wazee, August 2006. 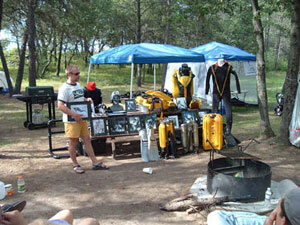 Ryan Spence of Colorado presents a portion of his Cousteau collection to the vintage divers at Lake Wazee. Ryan is a foremost expert on Cousteau memorabilia, and his collection contains many one of a kind items. It is a real treat to see the collection in person. 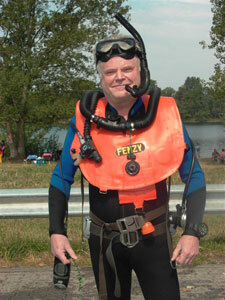 Terry Stevens of Benzonia, Michigan, at Lake Wazee, 3rd Annual Vintage Dive Assembly. Ryan Spence with scooter at Lake Wazee. Photo courtesy of Terry Stevens.